Dreamworks' latest animated treat for the kiddies is set in ancient China. 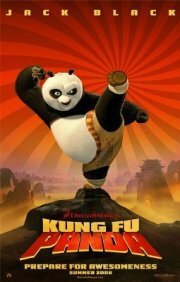 Our hero is a panda, who finds himself chosen as a Local Hero to fight against the evil dragon. He has no Kung-Fu training and has to undergo a crash course, before setting out with five seriously skilled warriors to do battle and save his people. Action, Animals, Animated, Comedy, Family. The ballet of the dolls.